Pastor. Pastoring. Thoughts on Pastoring. Grace. Pastoral Grace. As you can well imagine, I have mixed feelings about this pending move. On the one hand, I'm excited by the opportunities and challenges offered by Laity Lodge, and look forward to joining the great team of people there. Yet, on the other hand, I feel deep sadness about leaving my church, especially leaving the wonderful people here who have loved me and whom I have loved for the past sixteen years. I would always have hoped that when it was time for me to leave Irvine Pres, both my congregation and I would feel some sadness about it. I'm glad folks aren't cheering, happy to finally get rid of me. (Or, if they are, they're doing it in secret.) But the sweet sorrow of leaving is, understandably enough, both sweet and sorrowful. It seems appropriate for me to compose some thoughts as I finish my ministry at Irvine Presbyterian Church. In the days ahead, I'll put up whatever strikes me as worth sharing with my blog readers. My hope in doing this is not only to do some personal reflection, but also to help others in their thinking about the church in general and pastors in particular. Most of my readers are not pastors, though quite a few are, actually. But most of my readers have pastors or priests, and are concerned about what happens in the church, at any rate. 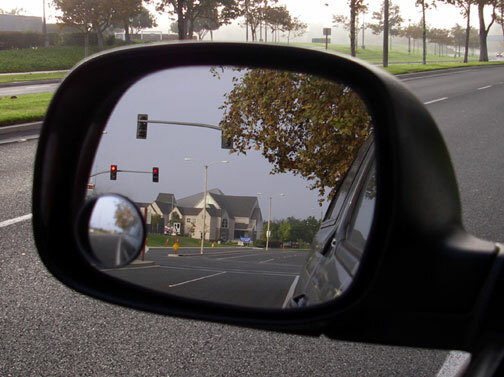 I have entitled this blog series Grace in the Rearview Mirror: A Pastoral Retrospective. The "pastoral retrospective" part should be pretty obvious, since I'm going to look back at my sixteen years as a pastor. Ditto with the "rearview mirror" imagery. But you may be wondering why I've chosen the word "grace" to sum up my ministry at Irvine Presbyterian Church. I'll begin to answer that question in tomorrow's post. I'm calling this series on my pastoring Grace in the Rearview Mirror. As I begin to reflect on my sixteen plus years as pastor of Irvine Presbyterian Church, the idea of grace comes immediately to mind. As this series progresses, I trust you'll see why grace has been such a central part of my ministry as a pastor. But I didn't invent the connection between ministry and grace. I got it from St. Paul, who associates the two concepts several times in his letters. Of this gospel I have become a servant according to the gift of God’s grace that was given me by the working of his power. Although I am the very least of all the saints, this grace was given to me to bring to the Gentiles the news of the boundless riches of Christ. Paul is an apostle because of God's grace, plain and simple. Grace, by the way, is God's unmerited favor or kindness. It is God giving us goodness that we do not deserve. By definition, grace cannot be earned. It's always a gift. A chapter later in Ephesians, Paul explains that all Christians are recipients of the grace that enables them to be ministers: "But each of us was given grace according to the measure of Christ’s gift" (Eph 4:7). This grace becomes activated when Christians engage in ministry, "building up the body of Christ" (Eph 4:12). Paul was an apostle of Jesus Christ, not by his own volition or effort, but by the grace of God. This grace wasn't wasted on Paul, because it led him to work hard as a minister of Christ. Yet Paul saw even his strenuous labors as God's grace active within and through him. Did Paul work hard as an apostle? Yes, indeed, harder than others like him. Yet it really wasn't his effort, but God's grace at work in him. Christian ministry is like this, whether it's done by apostles, pastors, or lay people. It takes lots of human effort. It can be downright tiresome. It's hard work. Yet, from another perspective, ministry is not so much our effort as it is the flow of God's grace through us. I'm not saying all of this to boast (or to confess my foolishness, for those of you who don't see overworking as a cause for boasting!). I'm simply noting that, like Paul, I worked hard. (Paul, by the way, worked full-time as a tentmaker, and did his Christian ministry as a lay person.) Moreover, like Paul, I feel the need to qualify my statement of working hard by adding that it really wasn't me, but God's grace active through me. I know this sounds like the kind of religious things that pastors are apt to say. But I really mean it. For one thing, I believe that all the talents and gifts that enabled me to be a pastor were gifts from God. Moreover, there were many times, hundreds upon hundreds, when I sensed God's extra help as I did my pastoral work. I expect there were thousands of times when God was graciously assisting me even though I didn't realize it or give Him the credit He was due. In my next post in this series I'll supply some examples of how I experienced God's grace in my pastoral ministry. In my last post I explained my conviction that my pastoral work at Irvine Presbyterian Church was by God's grace. The gifts and talents that enabled me to be a pastor are themselves evidence of grace. Moreover, in many and various ways I experienced God's grace in the form of extra help when I most needed it. There were quite a few times during the past sixteen years when I became discouraged. Often these were associated with overwork, and with my subsequent neglect of my family, my devotional time, and my personal health. But they usually began with some negative event, or perhaps with a harsh word of criticism from somebody in the church. When my heart felt heavy, I'd call out to God for help. Sometimes this process of crying out went on for days or even months. But there were other times when the Lord answered my prayers quickly. For example, dozens of times when I was feeling discouraged, a member of the church would come up to me and, out of the blue, tell me a story about how something I had done really helped them in their faith. Similarly, there were many times when encouragement would come in the form of thank you notes or e-mails. These were such obvious instances of God's grace helping me to keep going as a pastor. Yet I want to add a word of caution. The examples I have just given might suggest that most of the time I was pastoring in my own strength. Then, in special moments, God helped me. I would admit that it sometimes felt like this. I can be rather dull spiritually, I must confess. But when I look back upon my ministry, I can see clearly that God was at work in and through me even when I was completely unaware of it. The special gifts of grace, like preaching illustrations or notes of encouragement, were simply times when God's goodness to me was so obvious I couldn't miss it. Besides, I believe that the natural talents that I used as a pastor were themselves gifts from God. As Paul wrote in 1 Corinthians 4:7: "What do you have that you did not receive? And if you received it, why do you boast as if it were not a gift?" 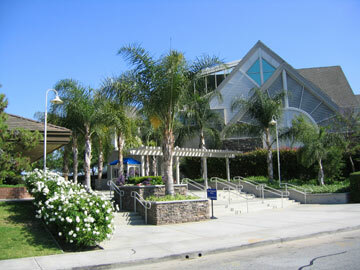 From this perspective, everything I invested in my ministry at Irvine was a gift of grace. This doesn't deny the fact that I worked hard. But it sees even my very ability to work, my health and personal energy, as God's grace active within me. Thus, as I look back at the last sixteen years of pastoral ministry, I rejoice in God's grace, and I am filled with gratitude. I'll have more to say about gratitude in my next post. Every time I sit back and begin to reflect on my last sixteen years of ministry at Irvine Presbyterian Church, I am flooded with gratitude. At first my mind is filled with images of people, people who have been my colleagues, friends, brothers, sisters, fellow-laborers, and prayer partners. I think of those who have been consistently faithful as encouragers. I remember those who have opened their hearts to me as they have struggled with hard things, and then who have shared their joy in subsequent times of blessing. And so it goes, on and on. I am grateful for so many things God has done in this church during the last sixteen years. Some are obvious, like new buildings or new ministries. Most of God's works have been less obvious, having to do with people's souls. I have seen God do amazing things. Let me cite just one example. Several years ago a young woman made an appointment to see me. Carolyn was a brilliant graduate student at the University of California, Irvine, on the way to finishing her Ph.D. in Chemistry. As I soon learned, she was also Jewish. Why was she meeting with a Christian pastor? Because Carolyn was interested in Christianity, and had "a few questions." A few! She brought in a list of the twelve toughest questions about Christian faith, from "Why does God allow suffering?" to "Why is Jesus the only way of salvation?" As Carolyn asked me her questions, and as I tried to offer some reasonably coherent answers, I felt discouraged. "Here is this bright young woman," I thought, "a Jewish grad student in science, and there's no way I can begin to satisfy her concerning so many tough issues." I felt terribly inadequate, rather like a failure as a pastor. At the end of our meeting Carolyn allowed me to pray for her, and I promised to keep doing it. Sometimes I would see her in the congregation while I preached, and I would offer a silent prayer that God would make Himself known to Carolyn. But I knew the odds of a Jewish grad student in Chemistry becoming a Christian weren't high, at least from a human perspective. So my prayer wasn't exactly bursting with faith, I have to confess. About a year after our first meeting, I had the incredible privilege of baptizing Carolyn as she made her public profession of faith in Christ. In that moment I felt overwhelmed by God's grace to Carolyn and, in some small measure, to me. What a joy it was to have been a part of her journey to faith! I couldn't even begin to count the number of times I have experienced God's grace in my ministry. I've already written about that. Each time I sense God's kindness, I felt a huge measure of gratitude. And as I look back at my ministry in a rear view mirror, my gratitude mounts up even higher. Baptizing a high school girl who became a Christian. Yes, am immersing her (sort of) in a kiddie pool. 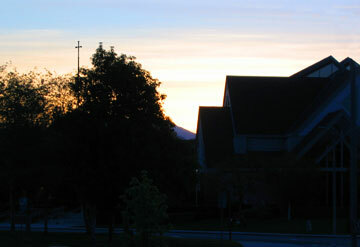 The Sanctuary of Irvine Presbyterian Church early on Easter morning before the sunrise service. 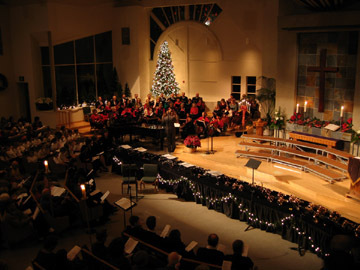 The sanctuary during our Festival of Carols celebration. 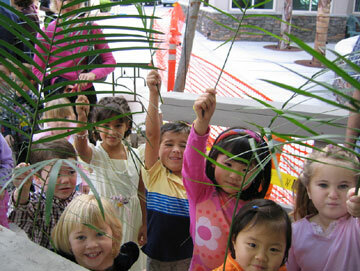 Some of the children of the church getting ready to celebrate Palm Sunday. A scene at my installation as pastor, on June 29, 1991. 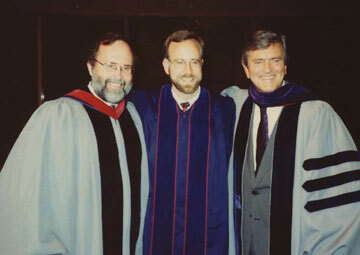 From the left: Ben Patterson, our founding pastor; me; Lloyd Ogilvie, my mentor and, at that time, the pastor of the First Presbyterian Church of Hollywood. 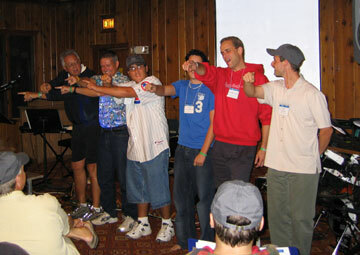 A few men at our Men's Retreat in the "Whar's the bar?" skit. A fine tradition of humiliating the newcomers in Christian love. 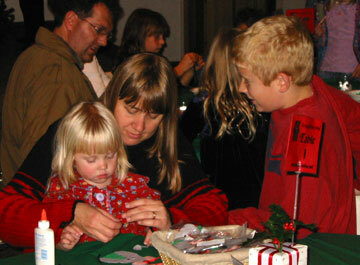 A family working on their craft at our Christmas Craft Night in early December. 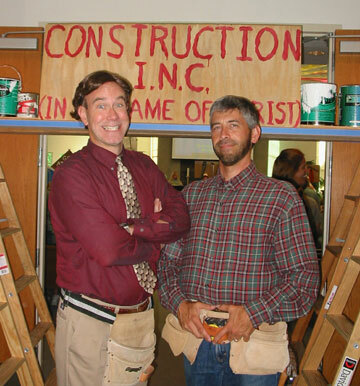 Tim the Tool Man Taylor (aka Mark Roberts) and Al Borland (aka Tim Avazian, one of my associate pastors), all dressed up for our annual VBS skit. That's a fine head of hair I have, don't you think. 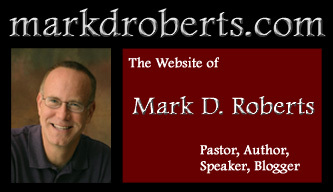 In truth, a member of our church who knew me well say me and thought to himself: "I never knew Mark had a brother. His brother has a terrible haircut!" 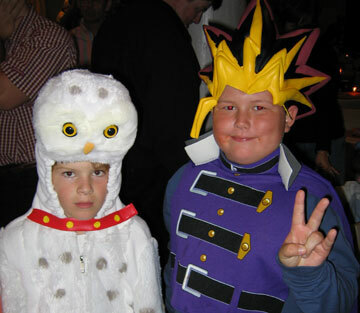 A couple of church members dressed up for our annual Harvest Festival in October. 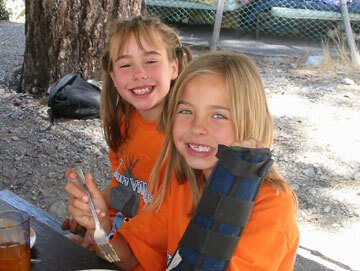 My daughter (left) and her friend at camp. Yes, the friend is proudly displaying her broken arm. One of my favorite moments in the year. On Thanksgiving Eve we had a worship service, in which people were free to share with the congregation that for which they were thankful. Every year, a time of joy, laughter, tears, and lots of gratitude. 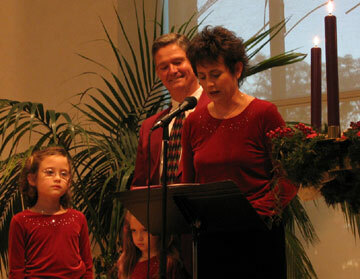 Another of my happiest moments: the lighting of the Christ candle of the Advent wreath on Christmas Eve. We had families (and sometimes groups of friends) light the candles, with readings from Scripture and prayers. Always a sweet time. I do not look back at my ministry at Irvine Presbyterian Church with many regrets. Oh, I certainly made my fair share of errors. But the congregation managed to forgive me for these, and God had a way of turning what I had messed up into good. I wouldn't even want to retract much of what I said in my sermons, except, perhaps, for one foolish illustration. It happened years ago, maybe in my first couple of years as pastor of the Irvine church. I was preaching a sermon on 2 Corinthians 5, where the text says that "the love of Christ urges us on" (5:14). Other translations say the love of Christ "controls us" (ESV) or "compels us" (NIV). The Greek verb from which these translations derive, synechein, literally means "to surround" or "to constrain." So we have a rather strange image of the love of Christ both surrounding us and, at the same time, urging us on. What sense does this make? So how can the love of Christ both surround us and move us forward at the same time? I think of those little packets of condiments. Now I've got to admit that sometimes I hate those things. They never seem to work quite right. Sometimes they break, making a mess all over the place. One time when I was on a plane, one of them squirted all over my tie. But what you're trying to do is to squeeze them on the outside so the substance on the inside will go forward. That's rather like the love of Christ. Now as I was using this silly little analogy, the congregation responded much more than I had anticipated. Rather than a little chuckle, my condiment illustration received roaring laughter, especially the part about squirting on my tie. It didn't make much sense to me, but I went on with the sermon. Afterwards, a friend came up to me and said, "Do you know why we were laughing so hard at your bit about the packets of condiments?" "No," I admitted, "it made no sense to me why I got such a strong response. My illustration was silly, but not that funny." "I know what you were trying to say," he explained. "But you have to realize that we didn't hear you correctly. 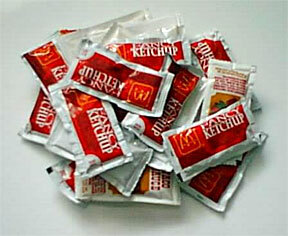 You said 'little packets of condiments.' But we thought you said 'little packets of condoms.' If you go back and think about what you said, you'll realize why we were laughing so hard." So I went back over what I had said, and realized to my horror that my little packets of condiments illustrations didn't work quite as I had planned. (Go back and change "condiments" to "condoms" and you'll see what I mean!) Embarrassed, I thanked my friend for letting me know. 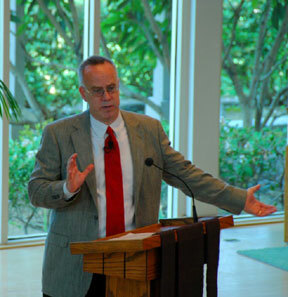 In the second service I jettisoned the word "condiments," speaking instead of "little packets of ketchup." As expected, I got a few chuckles from the congregation, and that was all, thank God! And, yes, folks did forgive me for a poor choice of words, though a few of them didn't let me forget about it for a while. They had too much fun laughing at what they thought I had said in the middle of church. There were many times during the past sixteen years when I thought I had the best job in the world. Yes, of course there were other times as well, and I'll have something to say about them in due course. 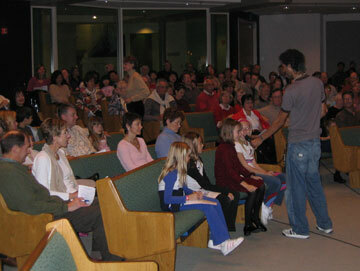 But for most of my years as pastor of Irvine Presbyterian Church, I felt extraordinarily blessed. When did I think I had the best job in the world? There were many times, actually. Often it would happen on Thursday mornings. Thursday, you see, was my sermon prep day. It began with what I called The Pastor's Study, a dialogical Bible study of about fifteen people. We'd focus on the text I was going to preach on that week. I'd prepare some comments and background. Then we'd dive into the text and its meaning for our lives. This was some of the most fun I had as a pastor (truly), and I learned a great deal while sharing life with some great folks. Then, after the Pastor's Study, I'd spend the rest of the day working on my sermon. There were many times, dozens and dozens, when I'd think to myself: "What a fantastic job! I get to study the Bible and talk to people about it, and they pay me for this!" One of the greatest privileges of being a pastor is that people share their hearts with you. They come in with the most tender parts of their lives, sharing their fears, their failures, their dreams, their hopes. Yet the wonderful part for me wasn't just the trust involved in such conversations, but the joy of seeing God work in people's lives in a deep way. For example, I'll never forget an Easter morning several years ago. I preached, as always, a sermon that focused on the good news of the resurrection, and that called people to put their faith in Christ. (Actually, to be precise, I preached that sermon four times each Easter morning.) One year, after the second service, a woman from our congregation came up to me in tears. "I need you to know what happened during the last service," she said. "What was it?" I asked, not sure whether her tears were joyful or sorrowful. "I brought my mother to church today, as I have for so many years. She isn't a believer, but she'll come with me on Easter. I always pray that she'll become a Christian, but it never happened . . . until today! When you invited people to give their lives to Christ today, my mother did! And then she told me! I am overcome with joy and thanks, and I wanted you to know." Then I too was overcome with joy and thanks. After I finished greeting the other worshipers, I made my way to a small room behind our sanctuary, where I could be alone. I literally got on my knees and wept with joy, thanking God for the sheer privilege of preaching the gospel. What an amazing thing to be a part of God's saving work in people's lives! And you know what, you don't have to be a pastor to experience this sort of joy. All of God's people are called into His service. The Best Job in the World, Except . . . In my last post I explained why I often thought that I had the best job in the world as Pastor of Irvine Presbyterian Church. In fact, I often told people that I felt this way about 75% of the time. About 23% of the time I felt that I had, well, a job. It wasn't especially wonderful or awful. It was simply a job. If you're good at math, you realize that I've left out 2% of my experience as a pastor. During that 2%, I felt as if I had one of the hardest jobs in the world. Pastoring isn't hard the way cleaning bathrooms is hard (a job I did while in college). It isn't hard in the same way as digging trenches or discovering the properties of sub-atomic particles. And it isn't hard in the way being a mother of toddlers is hard, or being a kindergarten teacher. And it surely isn't hard in the mode of a soldier or a firefighter or a police officer. So what makes pastoring hard? There are a variety of factors. One has to do with the complexity and significance of certain pastoral decisions. There were times I had to make judgments that felt way out of my league. In these times I got the best input I could get, I prayed like mad, and then decided. I'm sure other jobs require a similar kind of decision-making. Some, no doubt, involve even higher stakes. I never had to decide whether or not to go to war, or whether to send troops into a particularly dangerous area. For me, and for many other pastors I know, one of the toughest parts of the job involves receiving criticism. I'm aware that most human beings don't like this, but it can be especially hard for pastors for a couple of reasons. First, pastors tend to be tenderhearted people, folk who would be by nature and upbringing ill-prepared to handle harsh criticism. 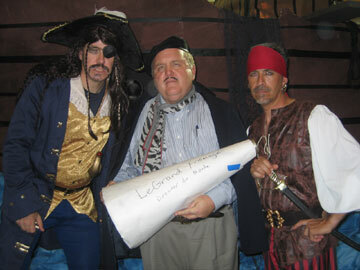 Second, much of pastoring is very personal. When I give a lecture in a seminary course, if someone doesn't like the lecture, I don't fret too much. But if somebody doesn't like a sermon, I take this personally, because preaching is personal, intensely personal. When I preaching, I don't just lay out interesting theological ideas. I bare my soul, often sharing my deepest convictions and sometimes even my personal failures. If somebody doesn't like a sermon, chances are pretty good that somebody doesn't like me, or at least a substantial part of me. And this hurts. 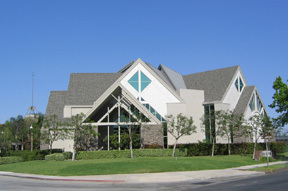 Let me be clear, in defense of the truly wonderful congregation at Irvine Presbyterian, that the vast majority of comments I received during my tenure were positive. Most of the time I felt greatly loved and appreciated. The actual ratio of praise to criticism was, for me, probably something like fifty to one. But because of my own sensitivity, combined with my insecurity, one word of criticism had the power to outweigh five hundred words of praise. This was my problem, to be sure, but it didn't mix well with being a pastor. It was also true, by the way, that sometimes criticism I received was warranted, and ultimately helpful to me. But this didn't mean I found criticism easy to hear. Part of what makes receiving criticism in church so hard is the way some people do it. Now I should hasten to add at this point that the majority of people in my church who shared a critical word with me did so with due love and respect. But some didn't. And a few got downright mean. Over time, I came to understand that the nasty folk were almost always overreacting because of some pain in their own past. If somebody chewed me out mercilessly, changes were good that person had a terrible relationship with a merciless father or mother or both. Nevertheless, it was hard to receive such harshness graciously. Some folks would tell me that I needed to get thicker skin. But I think thick skin is pretty much incompatible with Christ-like pastoring. A fourth reason I found pastoring difficult had to do with personnel issues. 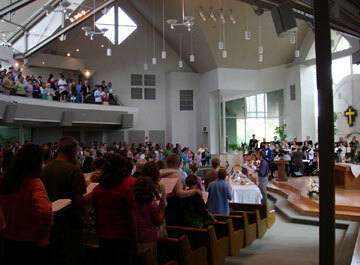 As Pastor of Irvine Presbyterian Church, I was also "Head of Staff." This meant I was, at least in some capacity, the boss. (In our strange Presbyterian system, however, my actual authority was quite limited.) Therefore, if a staff person in a significant ministry role wasn't working out, I was significantly involved in the process of letting that person go, or, to be fully honest, making that person go. As a softhearted person, this was very hard for me. But it was complicated by the fact that I was doing this in a church, where, often, the staff person who needed to leave had many friends and supporters. So almost inevitably, when it was time for a staff person to leave, or way past time, the process was very painful and divisive within the church. Every time we let somebody go, we'd lose members as well. So far I've said that pastoring is hard because of the difficulty of some decisions, and the heaviness of people's burdens, and the painfulness of receiving criticism, and the implications of personnel decisions. But I haven't mentioned the aspect of pastoral life that I found most challenging of all. I'll save that for tomorrow's post. In yesterday's post I explained several things I found difficult about being a parish pastor: the difficulty of certain decisions, the heaviness of people's burdens, the painfulness of receiving criticism, and the implications of personnel decisions. For me, these were indeed troublesome. But the hardest thing about being a pastor, in my experience, is dealing with people's expectations. • To be good oral communicators and to have truthful theology. • To be caring counselors, good listeners and people of prayer who can help folks get through hard times and grow in their faith. • To be present in personal emergencies, like unexpected hospitalizations or deaths in a family. • To guide then through the intricacies of planning and performing weddings and memorial services. • To be visionary leaders who can help churches both remain strong and grow in their ministries. • To be wise and attentive managers of staff (if that's in our job descriptions). • To be decent writers, at least for the church newsletter and for other pastoral communications within the church. • To be able to respond intelligently to a myriad of personal and theological questions. • To be readily available to the congregation. • To represent the church well in the community. • To live exemplary moral lives. • To be prayerful both in public and in private. I'll stop here, though you could certainly add to my list. Let me say clearly that I think many of these expectations are quite fair. I think almost all pastors should be good at preaching or teaching, and should be caring people who set a good example in the way they live and who are indeed people of prayer. So I'm not complaining about the fact that people have expectations for pastors. Also, you may have noticed that I said the hardest part of pastoring is "dealing with people's expectations." This is the responsibility of the pastor. The fact that I sometimes had a hard time dealing with the expectations people had for me isn't necessarily their fault at all. It often had to do with my own insecurity, need to please, and lack of clarity about my own calling. But I think it's certainly true that it isn't quite fair to expect pastors to be good at all of the things on my list. For example, people who are visionary leaders tend not to be great managers because different skill sets are needed for the different tasks. Strong managers often have to be tough with people, which is not a trait easily found among tenderhearted types who are good pastoral counselors. Or, if a pastor is going to be an effective preacher/teacher, this requires time for study. Devoting such time means that the pastor cannot be available to the congregation in the way some folks would like. I found the diverse expectations of people difficult because it was absolutely impossible for me to fulfill such diverse expectations, and that meant I had to live with a measure of unhappiness with me. This was not easy for me. But some good things came out of it. For one thing, I was continually forced to evaluate myself and my work. Was I doing the most important things? Was I shaping my priorities according to God's truth, and not according to people's wishes? Toward the end of my tenure at Irvine Presbyterian Church, I began to ask my board of elders for help with my "diverse expectations" problem. How I wish I had done this years earlier! They were willing to help me, and so a conversation began. That discussion wasn't an easy one because, as you might imagine, the elders themselves had differing views on how I should spend my time. Some wanted me to focus on teaching and preaching. Others preferred that I spend more time in personal counseling and discipleship. Others thought my priorities should be in the area of personnel and program management. Nevertheless, I'm glad we began this conversation, even though it ended up not being relevant to my particular ministry. It is the beginning of a crucial conversation about the job description of the pastor who will replace me. By far the best thing about the hardest part of being a pastor was the fact that, when I felt overwhelmed by people's expectations, I was forced to turn to the Lord, to seek God's wisdom and guidance, as well as His comfort. I had to remember who my one true Boss was, and whom I most sought to please. Knowing God's pleasure in my pastoral efforts gave the strength to do what I believed to be most important, even if in doing so I wasn't winning any popularity contests. Of course what I've just said about living to please God isn't simply for pastors. All of us will find our true meaning and focus in life when we seek God's pleasure above all else. If I Had It To Do Over Again . . .
As I look back upon my ministry, I do not have many regrets, and the ones I have aren't major. I do wish, for example, that I'd found a way to spend more time with people and less time in administrative minutiae. And I wish that I'd been able to be more discerning about when key employees just weren't working out. And I wish that I'd been able to spend more time with my elders, working more closely with them on God's vision for the church. Since I can't go back and be more grateful, I can take time now to offer specific and extensive thanks to God. In fact, as soon as I finish this blog post, I'm going to do just that. 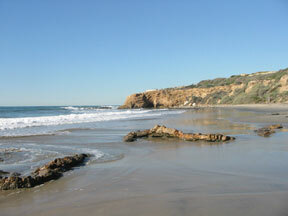 I'm going on a long walk on my favorite beach so I can offer lengthy and detailed thanks to God. Plus, I can make a new commitment to being more grateful in the future. Recently I've been using some classic spiritual exercises (Ignatian) to remind me of God's gifts during the day. I need to do this more often, even on a daily basis. Second, if I had it all to do over again, "I would believe God more." You'll notice that I put that last phrase in quotation marks. That's because it's not my line. It comes from Henrietta C. Mears, who was one of the most amazing Christians in the last century. I knew much about Miss Mears because she had been the leader of the education department and college department at the First Presbyterian Church of Hollywood, where I as Pastor of Education and College Director. I heard much about Miss Mears, who had pretty much become a Protestant Saint among those who knew her. In fact, I made a point of studying Miss Mears' life, listening to her teachings on tape, and trying to imbibe her visionary faith. Few people accomplished more for the kingdom of God in the 20th century than Henrietta C. Mears. Of course you might quickly think, "But what about Billy Graham? Or what about Bill Bright, founder of Campus Crusade for Christ?" Indeed, God used these men in amazing ways. But did you know that Henrietta Mears was crucial in their development as Christian leaders? God transformed Billy Graham's ministry while he was at a conference center founded by Miss Mears. And she led Bill Bright to Christ, discipling him into the kind of faith that led to Campus Crusade. • Building what was at that time the largest Sunday School in the country at the First Presbyterian Church of Hollywood. • Inventing graded curriculum for Sunday School. • Founding Forest Home Christian Conference center. 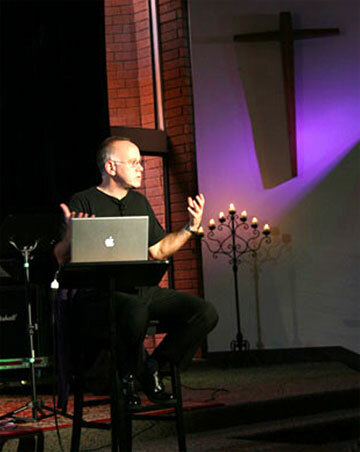 • Being instrumental in the calling of hundreds of young people into full-time Christian service. • Personally discipling and inspiring such leaders as Bill Bright, Billy Graham, and Richard Halverson (former Senate chaplain). For health reasons, Miss Mears retired from her position at Hollywood Pres in the late 1950s. As she neared the end of her life, somebody asked her: "What would you do differently if you had it to do over again?" Her response: "I would believe God more." What an amazing response from somebody who trusted God more than just about anybody in history! Yet Miss Mears knew that, no matter how much she had believed God, and how much He had been able to accomplish through her, she could still have trusted God more. As I think back on my time at Irvine Presbyterian Church, I wish I had believed God more. I think of how many sleepless nights I spent worrying about church problems that God resolved in amazing ways. I remember how many Decembers I worried about whether the church would close the year in the black, something that happened sixteen out of my sixteen years. I wonder how much more God would have been able to do through me, and through the church, if I had had more faith in Him. Like I said, I'm not groveling in self-criticism here. And there's no point bemoaning my former lack of faith. As in the case of gratitude, I can use these reflections to make a difference now and in the future. Even as I want to develop habits that will help me to be more grateful, I want to do the same with faith. Ironically, the kind of reflection that leads to growth in gratitude is the same kind of reflection that produces greater faith. It's all about attending more carefully to God's presence and activity each day.